(DULUTH, Ga.) – The 2017 NLL World Champion Georgia Swarm are proud to announce that Harrah’s Cherokee Casinos and the Eastern Band of Cherokee Indians have renewed their co-presenting sponsorship of the Swarm for the next three seasons. The three-year deal with the casino also ensures that the Swarm continues to play on Harrah’s Cherokee Casino Field during home games at Infinite Energy Arena. As part of the renewal, the Swarm will keep its patented Harrah’s Cherokee Casinos branding on both their home and away uniforms. This summer, the Swarm will continue to host a youth lacrosse camp on the Cherokee Reservation with Swarm players. The camp is free to Cherokee youth and has featured the Thompson Brothers in years past. The Swarm recently hosted their third annual Native American Heritage Night presented by the Eastern Band of Cherokee Indians on March 24. 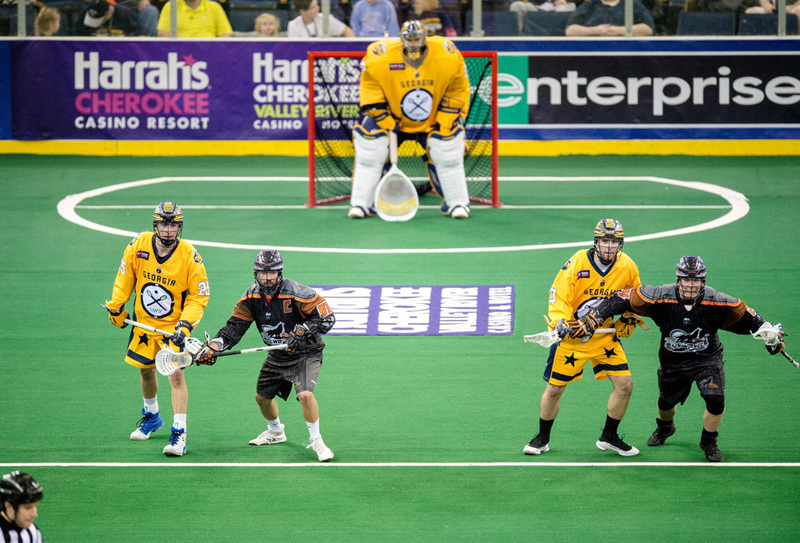 During its 17-12 win against the New England Black Wolves, the Swarm donned special Cherokee-themed uniforms. The uniforms honored the centuries-old sport of Cherokee stickball. The Swarm’s final home game of the 2017-18 season at Harrah’s Cherokee Casino Field at Infinite Energy Arena is against the Vancouver Stealth on April 28 at 7:05 p.m. ET. Fans can get tickets at GeorgiaSwarm.com/Fan or by calling 844-4-GASWARM.